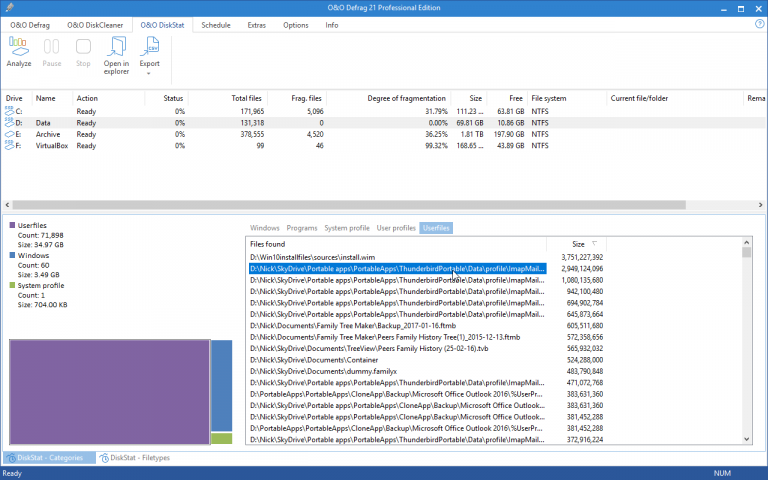 O&O Software GmbH has unveiled O&O Defrag Professional 21.0, a major new build of its renowned Windows drive defragmentation and optimization tool. Version 21’s headline new feature is that it includes a free version of O&O DiskStat 3, which can be used in conjunction with O&O Defrag’s DiskCleaner component to help clean up hard drives. O&O Defrag 21 also comes with the promise of faster file access and further optimizations to its DiskCleaner module. O&O DiskStat 3 is now built into O&O Defrag as a separate tab within the main O&O Defrag interface. Its main purpose is to locate and remove large and unnecessary files to provide a quick-and-easy solution to low storage problems. Users can sort results by category or file type, view them in Explorer to verify what they are, and export them in a table to allow the defrag of specific files. Other features include interactive diagrams and top lists. O&O Defrag 21 itself also gains improved defrag algorithms that it claims will not just cut down on system resources, but provide better file placement to improve access times. Another improved feature -- this one much requested by users of the program -- is that the DiskCleaner component has been further enhanced to allow automatic deletion of redundant files alongside a subsequent defrag to help boost performance further. Corporate customers also gain a significant improvement to O&O Defrag’s virtualization support -- in addition to being able to defrag on virtual machines, users can also now defrag files from the host too to maximize performance on both host and VM. O&O Defrag Professional 21.0 is available as a trial download for PCs running Windows Vista or later. The full version retails for $19.97, with a new five-PC license replacing the existing three-PC license also available for $49.90.